The new SP-570 UZ is the latest in a long line of super-zoom cameras from Olympus. In the distant digital past, Olympus was one of the first manufacturers to market a superzoom camera, and their C-2100UZ model, fondly referred to as the 'UZI' by its owners, quickly achieved something of a cult status. This camera was followed by an entire range of UZ models, but none of them had the image stabilisation feature that contributed so much to the success of the C-2100UZ. 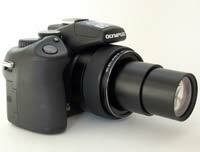 In consequence, Olympus lost much of its share of the superzoom segment to the likes of Canon and Panasonic. This all changed last year with the introduction of the SP-550UZ, which offered sensor-shift IS and leapfrogged the competition with a record-breaking 18x zoom lens. That camera was quickly followed by the slightly higher-resolution SP-560UZ, and now we have the 10-megapixel Olympus SP-570UZ, which boasts an entirely new 20x zoom lens, the biggest zoom lens on any compact digital camera. To counteract the inevitable effects of camera-shake, Olympus have wisely included a Dual Image Stabilisation system, plus there's an extensive ISO range of 64-6400. Other standout features include a 10 megapixel sensor, 2.7 inch LCD screen, macro mode of 1cm and full range of creative exposure modes (P/A/S/M). Zoltan Arva-Toth found out if the Olympus SP-570 UZ can live up to its proud heritage. 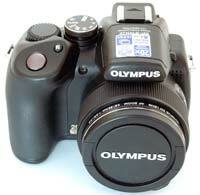 Looking at the Olympus SP-570UZ, one notices a�number of other improvements over the SP-560UZ. 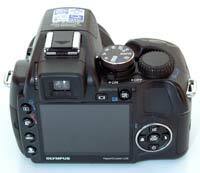 The grip has been enlarged and re-shaped, an SLR-like control wheel has been added, the on/off button has been replaced by a lever, a new switch and a button have appeared on the side of the lens barrel, the rear controls have been re-arranged, and the exposure compensation button has moved from the four-way pad to a place close to the shutter release. Even more importantly, the camera now sports a hot-shoe that accepts the same system flashes as Olympus' - and Panasonic's - DSLRs. At the same time, the ability to wirelessly control the Olympus FL-36R and FL-50R flash units, which may be placed on separate stands for creative lighting, has been carried over from the SP-560UZ. The rear of the camera is dominated by the 2.7" monitor, which boasts a fairly high resolution of 230,000 dots. Directly above it is the electronic viewfinder with a dioptre adjustment wheel, a button that toggles between the LCD and the EVF and an AEL/AFL button that locks both exposure and focus when pressed. To the left of the screen are four good sized buttons. The first toggles between Record and Playback, the second activates and deactivates Olympus' Shadow Adjustment Technology (which we'll explore later), the third is used to enter the menu, while the fourth cycles through the various information screens. To the right of the LCD, one finds the ubiquitous four-way controller with buttons that provide direct access to the two macro modes, the self-timer and an army of flash modes. The fourth button is customizable. In the middle is the OK/FUNC button which is used to call up a control panel, similar to the interactive status screen featured in the newer Olympus DSLRs. In the hand, the camera feels good. The rubberised grip provides a secure hold and a good resting place for your fingers. The on/off lever is within easy reach of your right thumb and so is the new control wheel. The shutter release is in a natural location for your index finger, and the exposure compensation button is also well placed. The SP-570UZ is powered by four AA-sized batteries. The battery compartment door is located on the bottom plate and has a plastic lock. Next to it is the tripod socket, which is now made of metal, but is still not aligned with the lens' optical axis. Moving to the right hand side, as viewed from the back, you'll find the memory card compartment door. The Olympus SP-570UZ has an xD-picture card slot only, unlike the company's DSLRs, which also accept CompactFlash cards. This is a problem in as much as xD cards are slower and more expensive, and few external card readers have a slot for them. In an emergency, you can also save about a dozen full-resolution shots in the SP-570UZ's�45-megabyte internal memory. As regards the lens, Olympus is playing the numbers game again, this time by packing a 20x zoom into the current model. The zoom range has been extended both ways, and now spans focal lengths from 4.6mm to 92mm. At the wide end, the diagonal angle of view is similar to that of a 26mm optic on a 35mm camera, while at the other extreme, it is equivalent to that of a 520mm super-telephoto lens. There is now a traditional-looking zoom ring around the lens barrel, but it is not mechanically coupled - all it does is give impulses to the micromotors that actually move the lens elements. This engineering solution, while not widespread, isn't new either - we have seen it in the past, on cameras like the Pentax EI-2000 and the Canon PowerShot Pro1, among others. It certainly succeeds in forcing you to hold the camera with both hands, which is one of the prerequisites for taking blur-free shots with any superzoom, stabilised or not. On the other hand, this electronic zoom ring is certainly not as responsive as its mechanically coupled peers. A quick spin will - after a bit of delay - send it through most of its range at a single stroke, useful if you want to go from one extreme to the other rapidly, but less desirable if precise framing is required. To achieve the latter, you need to turn the zoom ring rather slowly - and even then, you might find the zoom action to be jerky at times. The lens' maximum aperture is a fast f/2.8 at wide angle and a respectable f/4.5 at telephoto. Those who feel a 20x zoom still doesn't provide enough reach may purchase a TCON-017 teleconverter and mount it using the separately sold CLA-10 adapter ring. Taking hand held photos, especially in the longer half of the zoom range, carries the risk of your shots getting ruined by camera shake. This is where image stabilisation may come to the rescue. Olympus markets the SP-570UZ as having �Dual Image Stabilisation", mechanical and digital, but the latter means nothing but boosting the sensitivity to avoid having to use longer shutter speeds, so it is the former that really counts. The SP-570UZ, just like its immediate predecessors, uses the solution originally pioneered by Minolta in the DiMAGE A1, which counteracts camera shake by shifting the sensor in the opposite direction. By default, image stabilisation can only be activated from the menu, but you can assign it to the Up arrow of the four-way pad. 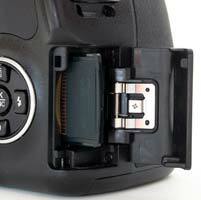 When set to On, IS kicks in whenever you depress the shutter release halfway, giving a faint, continuous sound. The live view on the LCD or EVF shows the stabilisation effect - the image appears to be floating in an almost surreal way. With IS, you can use about two times longer exposure times to take blur-free hand held shots than without it. This also means that IS is no cure-for-all - you will still have to mind your posture and hold the camera properly if you want sharp results, especially at the long end. Using the EVF instead of the LCD and pressing the eyepiece firmly against your head for is also advisable. Speaking of the EVF and the LCD, I found them quite nice in use. The LCD has an admirably wide viewing angle, and is fairly usable outdoors too, something that cannot be said of all LCD screens. Nonetheless you can always resort to the EVF if the sunlight gets too intense or if it simply suits your shooting style better. It is of lower resolution and naturally smaller than the rear screen, but is still one of the better electronic finders around. Importantly, both displays can show you overlaid shooting information if you so desire, and this includes Rule of Thirds gridlines and a live histogram too - albeit not both at the same time, which is a pity. 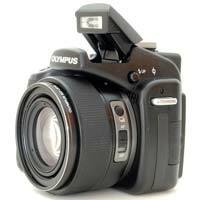 The Olympus SP-570UZ has a vast array of shooting modes. To start with, there is a fully automatic mode for those with absolutely zero photographic background. In this mode you just zoom, focus and shoot without having to fiddle with settings, which are all being taken care of by the camera. The only problem is that the camera hasn't the foggiest idea of what you are trying to photograph, and may therefore pick the wrong settings. Which is why it is a better idea to turn the mode dial to the SCN setting and choose from the 23 scene modes available. None of these require you to know anything about f-stops, shutter speeds, white balance or depth of field - all you have to do is tell the camera what type of scene you are planning to take a picture of by picking the appropriate scene mode. More advanced shooters need not be ashamed to resort to these, either - they can save them time when speed is paramount. Then there are the well-known P, A, S and M modes for those who already know the basics of photography - or are at least willing to learn them. The newly added control wheel comes in very handy when working in these modes. In A mode, it is used to select the f-stop, in S, the shutter speed. In M, the exposure compensation button toggles between the two functions. Simple and straightforward. My only gripe is that in P mode, there is no Program AE Shift function available. Other shooting modes include the following: MyMode lets you store and retrieve four sets of your most preferred settings. GUIDE isn't really a shooting mode but a compilation of tutorials which teach newbies a few tricks they might not know. Some of these are quite useful, e.g. the one that lets the user preview the effect of different exposure settings in a multi-frame window. The mode dial also has a Movie setting, in which you may specify the resolution (VGA or QVGA), the frame rate (30 or 15fps), and whether you want to take a silent clip or one with sound. In the first case, you may use the optical zoom and sensor-shift image stabilisation. In the second, you cannot. Exposure compensation is available in movie mode too, but exposure lock isn't. Finally, there is a Playback mode marked on the dial, which is totally unnecessary given that there is a dedicated Playback button on the rear panel. The camera offers a variety of focusing modes. New to the SP-570UZ is an AF/MF slider on the lens barrel which, while a little out of sight, allows you to quickly toggle between auto and manual focus. The former comes in a variety of flavours, including Face Detect, iESP, Spot and Area. Face Detect AF tries to find a face in the frame and if it succeeds, locks on to it. In iESP mode the camera uses several AF points and picks one of them at its own will. Spot AF is what most people would recognise as centre-point AF, while Area lets you choose the AF frame location yourself by way of the four-way pad, and then lock the chosen one by holding down the OK/FUNC button. There are two other auto focus options, Fulltime AF and AF Predict, both of which can be useful if shooting subjects in motion. Be aware that you might not have access to the full range of AF modes all the time, as their availability may be restricted by other settings. Low-light AF accuracy can be enhanced by enabling the AF illuminator via the menu, although as I have found out, it doesn't always prevent the focusing system from hunting and failing to lock on a subject in typical room lighting. In MF mode, you may try to focus the lens manually. By default, the left and the right arrow keys are used for this, but you can assign this function to the control wheel or the zoom ring, though the latter is not recommended as zooming is disabled in this case. A dedicated focus ring would have been a good idea. To aid you in achieving focus, the camera displays a horizontal distance scale and magnifies the centre of the frame - apparently by interpolation rather than by showing pixel-level detail right off the sensor. Locking focus in MF mode is done by pressing OK/FUNC. When it comes to flash photography, the Olympus SP-570UZ goes into battle unusually well armed. Firstly, it has a pop-up flash, which has a wide range of shooting modes, including auto, fill, slow sync on the 1st or 2nd curtain or almost any of these combined with redeye reduction. Flash exposure compensation is also provided. Thankfully, the flash doesn't pop up automatically, only when the photographer presses a dedicated button. It can act as a controller for Olympus' new wireless flashes but can also trigger any optically slaved unit - for this, its output can be set to one of ten levels. Secondly, the new hot-shoe lets you use any Olympus system flash with full TTL functionality (excluding the FL-40). Non-dedicated centre-contact flashguns may also be mounted, but only if their trigger voltage is low enough not to pose a threat to the camera's delicate electronics. 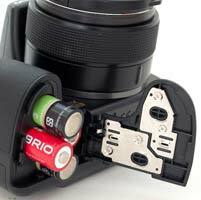 Another feature that can't go unmentioned is the wide range of continuous drive modes, accessible via a dedicated button on the lens barrel. Full-res shots can be captured at a lowly 1fps, but the camera also offers a faster Hi1 mode at 5 megapixels, and a 13.5fps Hi2 mode at 2048x1536 pixels. These sound a lot more exciting - but the quality is not what you'd expect, even when you consider the reduced pixel count. This is not just because the camera automatically increases the sensitivity to ISO 400. Apparently what happens is that the SP-570UZ takes a video at the specified frame rates, then takes the individual frames and blows them up to 3 or 5 megapixels. The resulting images don't print well except in the smallest paper sizes, so you'd better use these drive modes when shooting for the Web. For the record, there is a Hi2PRE mode as well, which is identical to Hi2 except that the camera starts buffering a few frames when the shutter release is depressed halfway, so that you don't miss the decisive moment. Neat, but the image quality restrictions still apply. A third feature worth expanding upon is the ability to shoot RAW files and develop them in camera. The SP-570UZ saves RAW data in Olympus Raw Format (ORF). These RAW files can not only be developed using Olympus and third party RAW converters, but also within the camera itself. The range of options is narrower, but this feature can still come in handy when you want to show your best shots of the day to someone who doesn't have a RAW converter installed on their computer. �Snappy" isn't the word I would use to describe the SP-570UZ's performance. Startup takes about three seconds, of which the first two keeps you wondering if the camera is doing anything at all. So it's not extending the zoom that takes up most of the time the camera needs to ready itself for shooting. But it's part of it, and if you forgot to remove the lens cap, startup won't be completed until you do so. Once powered up, the camera is reasonably responsive. Given its price tag, the SP-570UZ will inevitably be compared to SLRs, but these comparisons are going to be tricky. Zooming and focusing speeds are no match for an SLR, but if you factor in the time it would take to swap, for instance, a wide-angle lens for a super-telephoto, the superzoom starts to look competitive. One gripe I had concerned the control panel, which took about two seconds to appear each time I pressed OK/FUNC to call it up. The time it takes to save a RAW file also felt too long, but this might improve if you use a Type H xD card (mine was Type M). The camera comes with a printed quick start guide and a fairly well cross-referenced, 100-page PDF manual on disk. Also included is the Olympus Master 2 software, which is used to develop RAW files, manage your images and install firmware updates. Finally, you get a 30-day trial version of the Olympus muveeTheater Pack slide-show editor. PhotographyBLOG is a member of the DIWA organisation. Our test results for the Olympus SP-570 UZ have been submitted to DIWA for comparison with test results for different samples of the same camera model supplied by other DIWA member sites.